ROUNDTABLE “New publishing/New padagogies: how multimedia textbooks and mobile devices are changing the way we think about teaching in the classroom and the field” 12-1pm, Classroom 1005 @ Fedex Center. Presented and moderated by Dr. Dave Johnston, Research Scientist at Duke Marine Lab & Creator of Cachalot, the Duke-supported digital textbook. Faculty welcome! 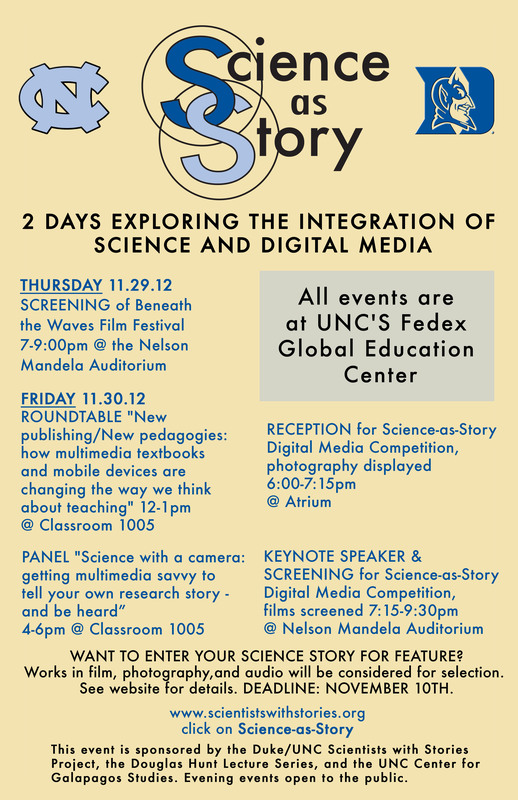 EXHIBIT of Science-as-Story Digital Media Exhibition, photography displayed 6:00-7:15pm in Atrium @ Fedex Center. Come meet the student journalists and scientists with works on display. Food and drinks will be served. Will any of the evening events include a question and answer session from the public? You should contact the organizers to find out.